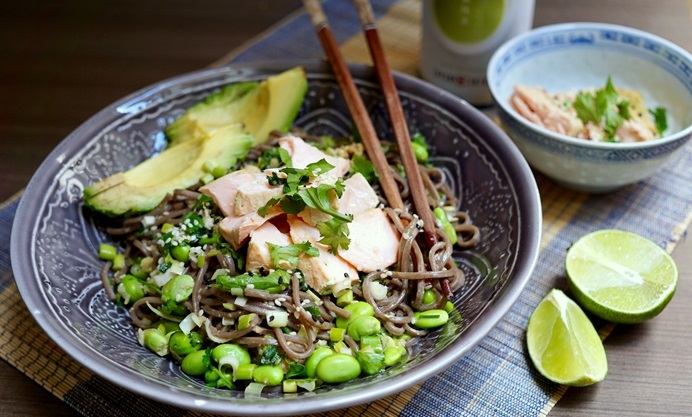 Take your lunch to the next level with Elly’s matcha-poached salmon noodle bowls, full of fresh and zesty flavours. Matcha is a form of powdered green tea and gives the salmon a wonderfully fragrant flavour. Poaching salmon fillets in green tea may sound a bit strange, but as with any form of broth-based poaching, it keeps the fish deliciously moist. Here, salmon fillets simmer softly in a fragrant broth of matcha, crushed peppercorns, chilli and mirin, until just cooked in the centre. The matcha gives them a herbal, almost grassy flavour that contrasts well with the rich, oily flesh of the fish. These fillets work beautifully on a tangle of nutty buckwheat soba noodles, peppered with crunchy edamame beans, spring onions and coriander, and dressed with a lusciously rich yet fresh mixture of sesame oil, lime juice, honey, soy and ginger. 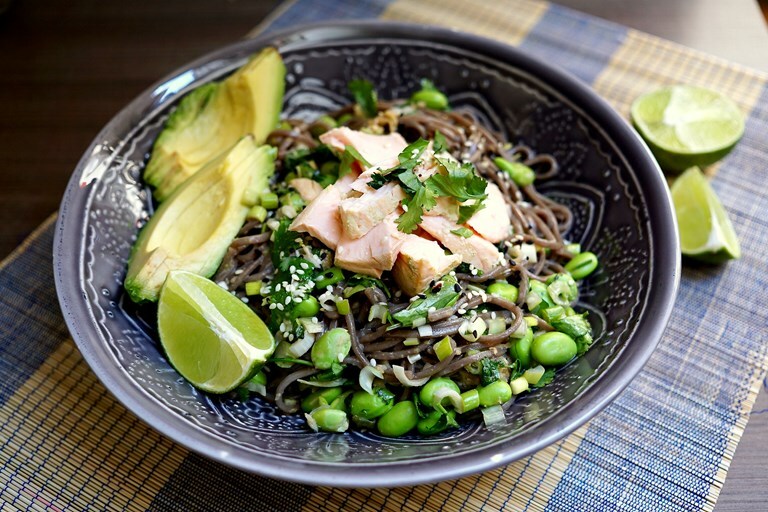 Topped with velvety avocado and a smattering of sesame seeds, this noodle bowl is addictively crunchy, zesty and creamy, punctuated by the flakes of soft, unctuous salmon. It’s a great way to experiment with matcha in the kitchen, and to enjoy the aromatic freshness it brings to a versatile array of recipes. Elly McCausland is a food writer based in Yorkshire. She is a keen gardener and loves cooking with home-grown produce.